Home / Scottish Brick and Tile Industry / Tool marks / Anniston Brick and Tile Works, Inverkeillor, Angus. 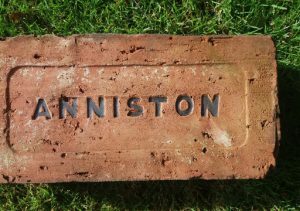 Anniston Brick and Tile Works, Inverkeillor, Angus. Anniston Brick and Tile Works , Inverkeillor. 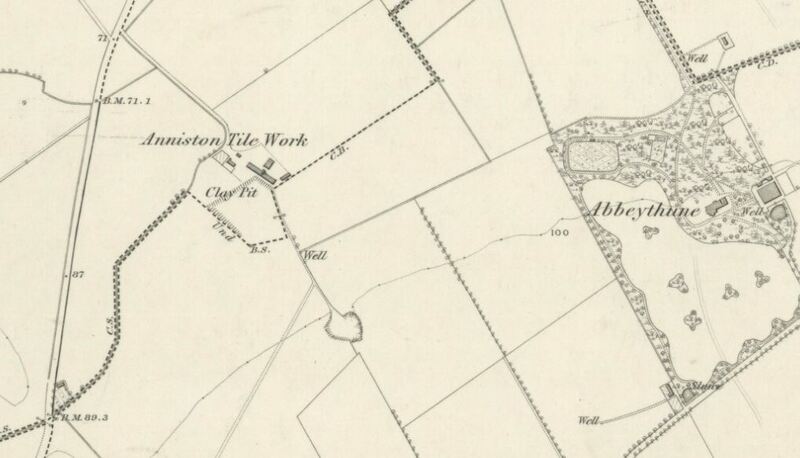 27/11/1860 – Dundee, Perth and Cupar Advertiser – Tile Work and the land of Estate of Anniston, Near Arbroath – The well known brick and tile work on the Anniston Estate at present possessed by Mr Duncan. This Work which has been long and successfully carried on by the present tenant is situated within 5 miles of Arbroath, and close to the Turnpike Road between Montrose and Arbroath. The Leysmill Station of the Scottish North Eastern Railway is within 4 miles of the Work. A great market is open for the supply of bricks in Dundee and to encourage the traffic the railway companies have agreed to be content with a very low special rate from that station to Dundee. There is an abundant supply of clay of the finest quality and easily got; and the Works being situated in a wide fertile district, the hitherto excellent demand for drain tiles may, in the hands of an enterprising tenant, be continued or increased. There is a good dwelling house and steading of offices, with sufficient drying sheds and a complete set of machinery; for the Works there is a steam engine of ample power, all in going order. There is attached to the Work, about 5 3/4 imperial acres of first class land and an arrangement may be made for enlarging the extent of the land as far as the tenant desires to give him horse labour at a cheap rate. For further particulars apply to Mr C Kerr, Dundee, the factor on the Estate, with whom offers are to be lodged. Mr Duncan the outgoing tenant is not to be an offerer. The Grieve at Anniston will point out the boundaries. 14/03/1862 – Kelso Chronicle – Scotch Bankrupts – Alexander Dunn, sometime tenant of the Anniston Tile Works, Forfarshire and presently joint tenant of the farm of Powmill, Kinrosshire. 1877 – David Harris – Brick and Tile Maker, 29 Millgate. Works Anniston, nr Inverkeilor. 1887 – 1888 – Harris & Stewart, Brick and Tile Manufacturer, Anniston. 1912 – 1913 – John Stewart & Sons, Brick and Tile Manufacturers, Anniston, Inverkeilor. 1915 – John Stewart & Sons, Brick and Tile Manufacturers, Anniston. 1926 – 1927 – John Stewart & Sons, Brick and Tile Manufacturers, Anniston, Inverkeilor. 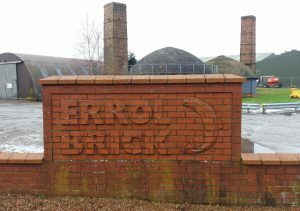 06/08/1937 – Arbroath Herald – Local brickworks – Since there is a change in the ownership of Anniston Brick and Tile Works, Inverkeilor, a few notes on the history of brickmaking will not be out of place…. 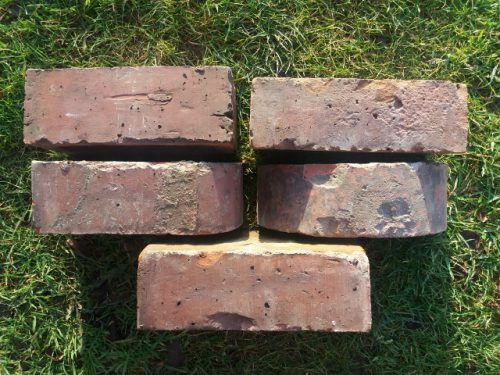 Angus clay can made into durable blocks for the purpose of housebuilding and in the vicinity of our local brickworks there are immense deposits of clay, which will not be “worked out ” in our time, or in the time of succeeding generations. All the clay used here is dug by hand —a laborious job indeed ! —then filled into hutches which are drawn up an incline to the clay mills by an endless rope. Such mills continually revolve around a trench, crushing and reducing the clay to powder and by the aid of other intricate machinery, the paste is mingled in a vat out of which it passes to other machines which form automatically the shapely brick. In its plastic form it is energetically whipped on to a barrow by waiting experienced hands and stacked in the drying sheds before being finally removed to the kilns. These kilns are large roomy places with several fireplaces round their sides and with a flue leading up from them to the top. All brick ware is packed carefully within them, care being taken to prevent one object from touching another, or they adhere the firing and are spoiled. Later on the doors are bricked up and every crack pugged with clay and the fires set a going. Workmen attend to this part of the job day and night to maintain the heat. 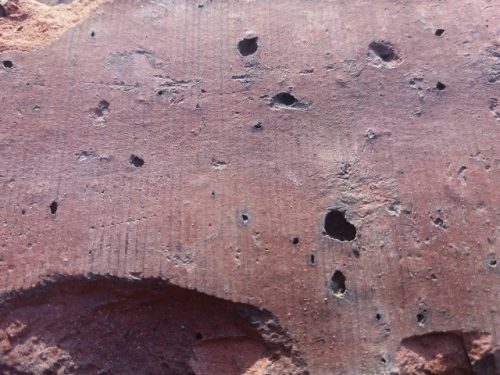 This heat is very often transparent, while the kiln walls average four feet in thickness to withstand it. Finally, however, the kilns are allowed to cool down, and when cold enough are “ drawn ” —that is—the fire brick cells are pulled to pieces, and the bricks removed. Then, they are stacked outside on waste ground, in huge square piles, ready for the market. The process of tile-making is in much the same order, but the quantity of brick supersedes these by a few million. 09/08/1938 – Dundee Courier – All parties having claims against the late Charles Stewart, Anniston Brick Works by Arbroath or against his firm J. Stewart & Son, Anniston Brick Works (of which the deceased was sole partner) are requested to lodge same with the subscribers within 10 days from this date and all parties indebted to the deceased or to his said firm are requested to make payment to the subscriber within like period. …….. 09/08/1938. 1942 – 1943 – John Stewart & Sons, Brick and Tile Manufacturers, Anniston, Inverkeilor. 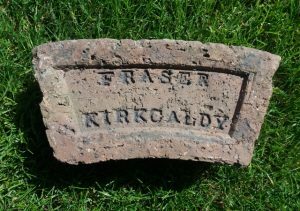 05/02/1943 – Dundee Courier – Draiange tiles manufactured by the Anniston Brickworks Co Ltd, Inverkeillor are renowned for their long life. Inquiries solicited. Phone Anniston 218. 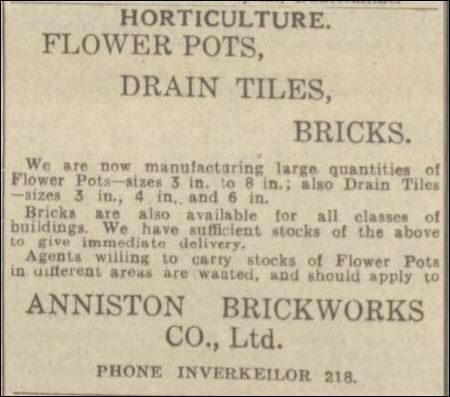 31/12/1943 – Dundee Courier – Drainage tiles – Anniston brick works have 3″, 4″ and 6″ drain tiles in stock. 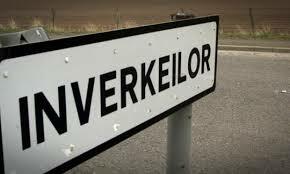 Phone Inverkeilor 218. Below – 20/09/1950 – Dundee Courier – Advert for Anniston Brickworks. 07/03/1955 – Dundee Courier – For sale, concrete blocks 18″ x 9″ x 4″, guaranteed good quality and finish.Other sizes to order. Phone Anniston Brick Works Co Ltd. Inverkeilor 218. For sale, concrete blocks 18″ x 9″ x 4″, guaranteed good quality and finish.Other sizes to order. Phone Anniston Brick Works Co Ltd. Inverkeilor 218. 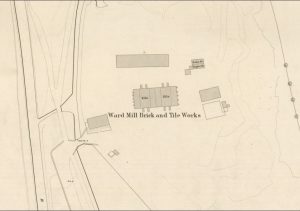 Below – A collection of bricks found near to the Anniston Brick and Tile Works and believed to have been manufactured there. 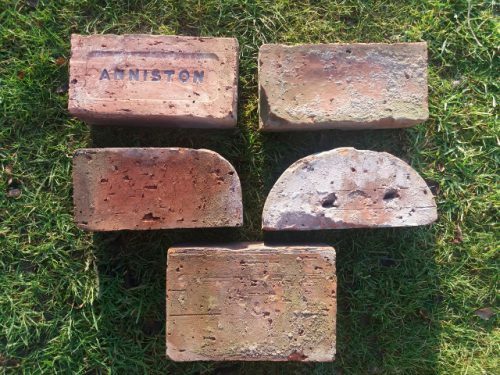 The brick marked ‘Anniston’ has one stretcher side that is graduated with small linear lines covering the whole face. The other bricks have this same ‘design’ on at least one brick face and thus confirm they most likely all came from the same Works. Below – a close up showing the linear markings. Below – the semi circular coping bricks also displays marks as left by a brick lifting tool. The outside to outside measurement of the holes left by the device are 4″ apart. Note the circular mark between the holes. 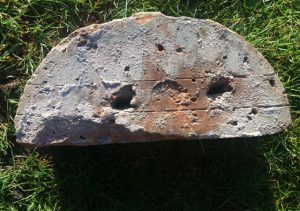 This was 1″ in diameter and was used as a ‘depth gauge’ to stop the brick worker pushing the lifting device in too far. Ward Mill Brick & Tile Works, Arbroath, Angus. 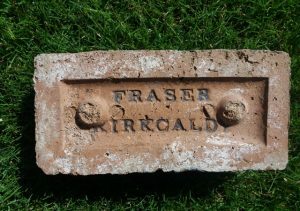 Found in Fife area – JC Industrial chimney brick Fraser, Kirkcaldy, Fife – Den & Galatown Brick Works, Kirkcaldy. . . .
Found in Fife by TS Fraser, Kirkcaldy, Fife Den & Galatown Brick Works, Kirkcaldy. . . .